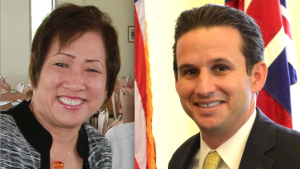 WASHINGTON — Rep. Colleen Hanabusa (D-Hawaii) on Thursday formally announced her plans to run for the U.S. Senate seat currently held by fellow Democrat Brian Schatz. Hanabusa, 61, former president of the Hawaii State Senate, was re-elected to the House of Representatives last year. Just before Sen. Daniel Inouye died in December at age 88, he asked that Hanabusa be named as his successor. Although Hanabusa was one of the finalists, Gov. Neil Abercrombie chose Schatz, 40, his lieutenant governor. Hanabusa will challenge Schatz in next year’s Democratic primary to serve the remainder of Inouye’s term, which runs through 2016. Inouye was re-elected to his ninth term in 2010. “I’ve made no secret of the fact that I have been considering my options for 2014,” Hanabusa said in a statement. “While it has been an honor and a privilege to serve the people of the First Congressional District and I have always done so to the best of my ability, I believe that I can do more to serve our state. “I have decided to run to serve Hawaii in the United States Senate. I will complete my full current term in the House of Representatives. “My legislative skills and experience will allow me to fully address the many serious issues we face at the federal level. I believe that I can do the job that Hawaii needs now. We need strong, effective leadership today to help guide and shape the policies that will have a profound effect on our state. I look forward to giving the voters a chance to speak, and earning the privilege of representing our state in the U.S. Senate. “It is critical that each of our senators have the vision, experience and abilities to do the job today. In the Senate, with two individuals representing each state, Hawaii stands on equal footing with every other state in the union. Our senators can ensure that our unique needs are addressed at the federal level. “I am confident that I can continue Hawaii’s decades-long history of providing leadership and vision in that chamber. “Hawaii will play a leading role as our nation continues to shift its focus to Asia and the Pacific region. Developing the technological innovations that will allow us to serve as a hub for international cooperation. Supporting our military at the doorstep of the defense, diplomatic and economic theater of the future. Encouraging business while standing up for working families and seniors. In May 2010, Hanabusa and fellow Democrat Ed Case lost to Republican Charles Djou in a special election for the 1st Congressional District seat vacated by Abercrombie when he became governor. In November 2010, Hanabusa ran again and defeated Djou. In a rematch between the two candidates in November 2012, Hanabusa won. The district includes downtown Honolulu, Pearl City, Waimalu and Aiea. Schatz’s endorsers include the State of Hawaii Organization of Police Officers, Hawaii Fire Fighters Association, United Food and Commercial Workers Union, Ocean Champions, National Weather Service Employees Organization, Hawaii Building and Construction Trades Council, University of Hawaii Professional Assembly, and League of Conservation Voters Action Fund. Before being elected lieutenant governor in 2010, Schatz served in the Hawaii House of Representatives.